“Sure, I remember Harry Olson!” laughed 98-year-old Walter N. “Swede” Hokanson the first time I called him back in January 2007. 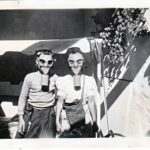 Swede called my grandfather a “roughneck, but a gentleman” and allowed that he and Harry “didn’t exactly hide behind the kitchen door” (I swear I could hear his wink over the telephone). 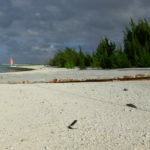 The two met working on Grand Coulee Dam and went on to Wake Island, where one of Swede’s proud accomplishments still stands today: the sturdy concrete seaplane ramp on deserted Peale Island. Walt Hokanson was born September 15, 1908, and grew up with many siblings on the family’s dairy farm in central Minnesota. He quit school in the 7th grade and put in long hours on the farm until at age 15 he’d had enough and left home for good. His skills, ingenuity, and confidence took him far and wide, working a variety of jobs in several states over the next few years. 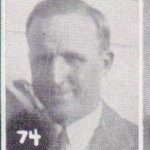 In the late 1920s Hokanson landed his first construction job as a water boy for the rigging crew on Coolidge Dam in Arizona, where he was tagged with the nickname Swede and met and married his first wife, Mae. Swede quickly learned the rigging trade and excelled at the dangerous, high-climbing job in high demand on the big dams being built across the West. 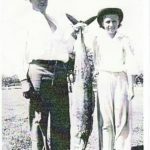 In the 30s he worked on the Hoover Dam, then Madden Dam in Panama, and on to Grand Coulee Dam in Washington State, while Mae and their little daughter June tagged along. When my grandfather got the job on Wake Island in late 1940, he told Swede that as soon as more money came through he wanted him to come along. Harry arrived with the Pioneer Party on Wake in January 1941 and Swede was on just about the next boat out, arriving in March. As Assistant General Superintendent for field work, Harry initially hired Swede as the rigging boss, but soon promoted him to waterfront superintendent. As war clouds gathered over the Pacific in the fall of 1941, the Wake construction project went into high gear. 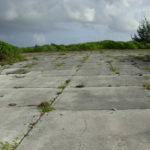 Key among the projects for the naval air station was the seaplane ramp and parking area for Navy PBYs on Peale Island. Swede and his crew built that 270-foot seaplane ramp in thirty days – “as tough a job a crew could do under those conditions, meeting the time schedule, and improvising what was necessary.” The job got off to a rough start during a stormy night when the barge carrying the precast ramp sections was thrown up on the rocks at the mouth of the channel, puncturing the bottom. Swede and his men quickly unloaded the sinking barge, assessed the damage, jerry-rigged a repair, pumped out the water, and were ready to go by morning. Installation of the ramp involved driving 60-foot pilings to bearing in the coral, welding the base of the ramp under 10 feet of water in an improvised caisson, then placing the precast sections into position and pouring concrete around the reinforced steel underwater. With the ramp complete, concrete crews poured the seaplane parking area. (Hokanson, 119-21, Building for War, 147). 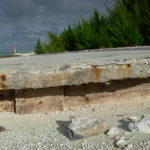 I doubt if any visitor to Wake Island has appreciated that big old concrete ramp as much as I did when I visited in 2011. Swede Hokanson ducked the fire in the first attack on Wake on December 8, 1941, and worked through the siege with Superintendent Dan Teters, directing work crews, reinforcing gun positions and then moving the heavy guns at night, jumping into ditches when the bombers came over, and dropping into their dugout for a few hours of sleep. After the war the Navy awarded Walter N. Hokanson the Bronze Star for his valor in the defense of Wake Island. When the Japanese captured Wake, most of the Americans were shipped off to POW camps within a few weeks, but Swede was among the group that remained on occupied Wake to work for their captors. He made it a point of honor to avoid the forced labor when he could and sabotage it when he couldn’t, and endured beatings when caught. In September, 265 POWs were shipped to Japan (the last 98 who remained were massacred on Wake in 1943) and Swede and most of the others were incarcerated in the notorious Camp 18. Malnourished, diseased, crippled, and beaten, they labored to build Sasebo Dam for the Japanese: 53 died there. When that camp closed they were moved on to others, though conditions remained abysmal. Swede was near death when liberation finally came in September 1945. It would take him nearly two years to recuperate enough to resume work and life stateside. 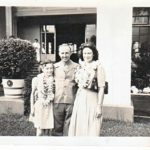 In early 1947, his old friend Harry Olson offered another job proposal: come with him to Guam and Tinian to reclaim abandoned military construction equipment and ship it back to the states for M-K. Swede followed up with another trip to Tinian and loaded out the last of the surplus to find his own buyers. After that, Swede bought a concrete block plant in Sacramento, CA, and built it into a successful business. Thirty years and two more marriages later, he retired comfortably to Kona, Hawaii, where he enjoyed family, friends, and the good life. 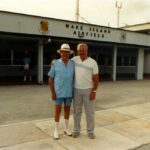 He returned to Wake Island on the survivors’ trip in 1988, accompanied by his wife and favorite nephew, Elwood Hokanson. 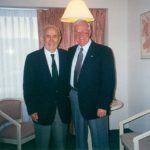 Swede wrote his memoir in 2003 at age 94, and passed away in December 2008, at age 99. Thank you so much! I always look forward to your posts. This one is especially interesting because I’ve read Swede’s book and knew June and granddaughter Sharly. My regret is that Dad (Harvey Savitz) is no longer here to visit with me about your research!